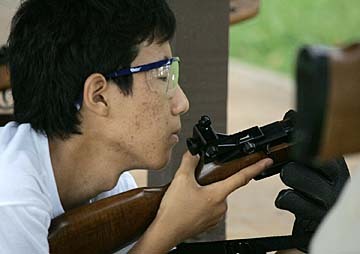 Roosevelt's Kevin Cho competed in yesterday's OIA air riflery championships at Pearl City High School. It was worth holding off his retirement. Kapolei air riflery coach Chris Fukaya got talked out of hanging up his guns at the end of last season. Yesterday, his girls team rewarded his decision by winning its fourth straight Oahu Interscholastic Association title at Pearl City High School. His Hurricanes outshot Pearl City 1,709-1,651 to win the team title, with senior Tricia Warashina claiming the individual crown with an aggregate total of 256. "My particular philosophy is we strive for improvement in every match we shoot," said Fukaya, who has been the coach for three years and got talked out of retirement by athletic director Elden Esmeralda. "We've been very fortunate that we had a group of girls come up to Kapolei and have been carrying on the tradition. The credit goes to them. They work very hard and are dedicated to what they do. "We're not a perfect team, but for what we do and what they do out there, I think it shows they have a lot of pride." The team competition pitted the top two teams from the OIA East and West divisions. The Hurricanes eliminated Roosevelt 1,712-1,611 in the semifinals and Pearl City defeated Kalani 1,651-1,544. The top seven shooters from each team determined the team score; in the finals, each of Kapolei's top seven shot at least a 232. The Chargers had five girls shoot at least 230, but their sixth and seventh shooters had aggregates of 221. Individual scores were comprised of shooting from the prone, standing and aggregate positions. Each shooter had 20 minutes for the standing and 15 for the other two positions to shoot a bull's-eye 33 feet away. "There's a lot of pressure this year," said Warashina, who also plays basketball and softball for the Hurricanes. "As a senior, you tend to slack off, but we were going to do this. We never really expected it; we just wanted to keep our title." On the boys side, Pearl City surprised favorite Roosevelt 1,690-1,638 to defend its team championship. A majority of the Chargers were freshmen or new to air riflery and at the beginning of the season, and coach Lester Aranaydo hoped his team would be able to make the playoffs. The Chargers did even better, going undefeated in the West for the second straight year. Pearl City had four shooters with at least a 241 aggregate in the finals, while Roosevelt had only two. Daniel Ing led the Chargers with a 255. "Basically, it was just do the best we can," Aranaydo said. "The first-year shooters really produced and shot well. It was a surprise win for us. We felt we'd be in there but hopefully it'd work out, and it did. The hard practices they put in were successful." Roosevelt's David Oshiro claimed individual honors with a 250 aggregate, but left before final results were announced at 6 p.m. Shooting began a little after 9 a.m.
"He just came along and just shot well today," Roosevelt coach Nathan Urabe said of Oshiro, who wasn't the team's top shooter during the latter half of the regular season. The top 27 boys and 26 girls qualified for the state championships to be held Nov. 1 at the Neal Blaisdell Center Exhibition Hall.